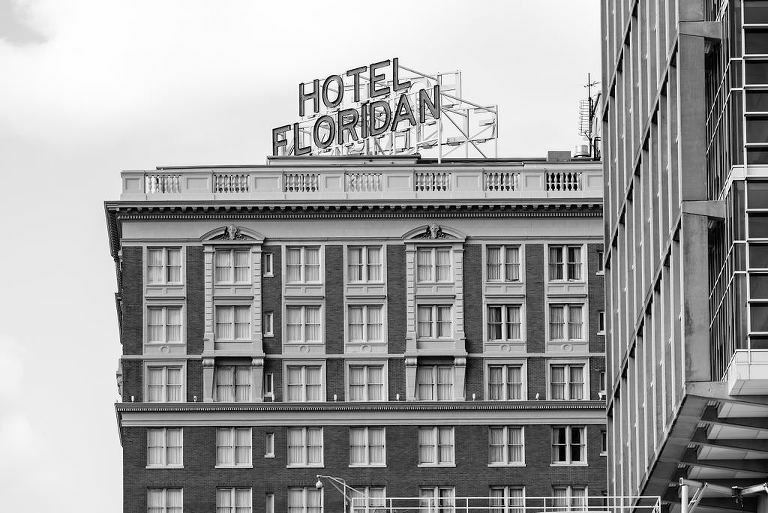 Ashley and Jacob’s downtown Tampa wedding embodied a timeless and traditional feel that truly captured the couple’s personalities and love for one another. Choosing a color palette of navy, periwinkle, gray and ivory, the Florida natives coordinated a weekend of memorable events so that their guests could take in the beauty of the place they call home. Ashley was an active Marry Me Tampa Bay reader, and we even had her share her planning experience with local wedding pros so that they could learn more about how bride’s think during the process. “As I was looking for my vendors and in addition to my own research on various sites, I used the Marry Me Tampa Bay wedding planning group to get recommendations from others in the area,” the bride shared. 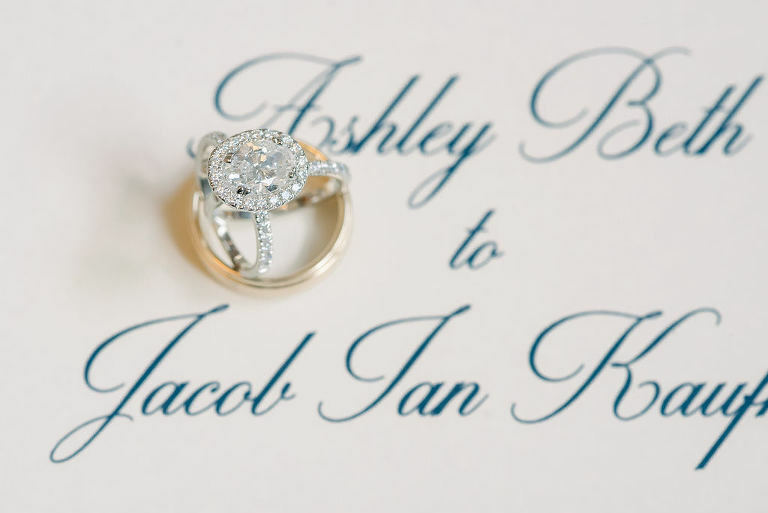 To execute a memorable wedding day, Ashley searched for a Tampa wedding planner who could help her connect the dots and minimize stress. Wanting to have their guests up and dancing throughout the night, the bride and groom looked to the help of seasoned wedding DJ’s, Grant Hemond & Associates to deliver the party. On a mission to find the perfect party favor, Ashley stumbled upon ShutterBooth while browsing Marry Me Tampa Bay. She knew the photo booth company would provide her guests with a sweet keepsake from her special day. Looking back, the bride and groom reminisced about the moment they finally locked eyes as Ashley made her way down the aisle. Jacob had been given a staycation trip for his birthday from his grandma and due to our busy schedules, neither of us had been able to take advantage of it until December. We agreed that after Thanksgiving with my family we would spend the following weekend at the Sandpearl by the beach. We arrived at the hotel in Clearwater on Saturday and were very excited to enjoy the day lounging along the coast as the waves rolled in. We spent the day catching some rays, walking along the water and enjoying each other’s company. Our plan was to watch the sunset before grabbing dinner at the resort. While we were taking in a beautiful night, Jacob proceeded to get down on one knee. As he got down, I was already crying, which made him completely forget his planned speech. After I said “Yes,” while choking back tears, we turned around and both of our parents were in the distance waving with excitement. Timeless, classic and elegant. 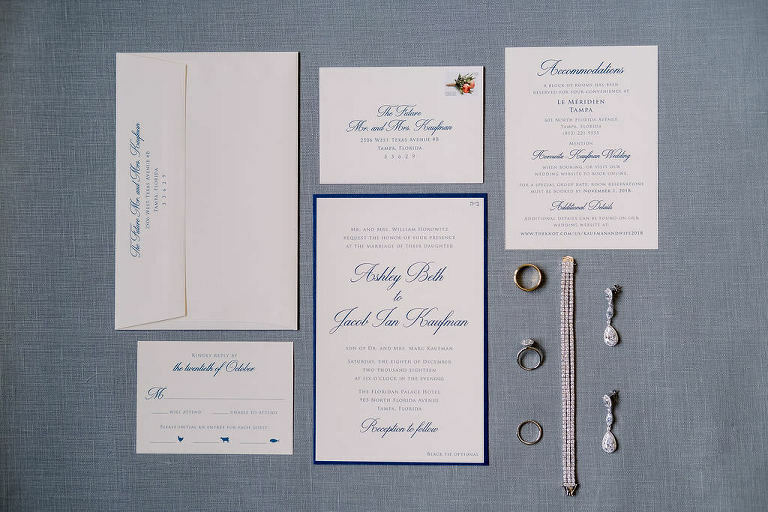 Jacob typically goes for more of a modern style, and I am more traditional, however, for our wedding, we knew we wanted to go for something more traditional. We both agreed that we wanted to have our wedding in a ballroom that was a bit different yet everlasting. Navy, periwinkle, gray and ivory, so a tad nautical, but still classic. I really loved these colors and felt like they went well together. It also worked out that the colors went perfectly with our venue and December nuptials. I knew I would be able to manage the wedding planning leading up to the day of, but learned early on that even though I was detailed and organized, having someone there to help execute the big day was crucial. There’s no way I would have been able to be the bride and run the whole operation for all of the vendors. I needed someone to be who could help me connect the dots and bring my vision to life without telling me what to do. It was also very important to find someone who could take charge and run the show behind the scenes since I didn’t want to stress on my special day about any issues that needed to be resolved. After a lot of research and conversations with several companies, I spoke with Jessie Soplinski at Breezin’ Weddings. Jessie embodied all the qualities I was looking for in a planner. Specifically, she was extremely prompt in replying to me, which never changed even after I hired her. Jessie was always quick to reply at all hours of the day and was very accommodating to my schedule. I like to meet with people in person when I can, and Jessie was more than happy to meet me wherever was most convenient for me. Having such an efficient, open line of communication with the team was huge because I realized as I was planning our wedding that vendors tend to take a while to call you back or sometimes don’t even return your call. Cindy, Breezin’s owner, always greeted me when arriving with a warm smile. I wasn’t just a transaction to Breezin’ but truly a valued individual and customer. While I had done most of the planning myself and hired Jessie to be the day of coordinator, I was amazed by all the other small details that needed to be considered and taken care of in the 30 days leading up to the wedding. We spent a lot of time reviewing all of the potential options for the wedding, and Jessie always let me be the one to make the final decision. At the end of the day, she truly was the glue that helped keep everything together. She really enabled me to capture my vision without missing any details. My day of wedding planner truly was my advocate stress reliever. When I wanted to do a walk through of the venue and florist mock-up more than a month out, Jessie made sure she was at the meeting even though she technically wasn’t contracted to begin helping me. She always made me a priority because that’s just the type of person she is. As a bride, there are so many times you panic over the smallest thing. The week of the wedding, I learned a few guests couldn’t attend last-minute due to a snowstorm. I had just submitted all of the numbers to the venue and printed the place cards and of course, I panicked feeling like the tables would have had to be rearranged last-minute. At 10 p.m. that night, Jessie immediately hopped on a call with me to talk through the possible options and solutions. All was solved, but having her there to support me and be level-headed through the process was priceless. Why did you choose to incorporate a photo booth into your wedding day? Everyone loves a photo booth, and the photos make for the perfect memorable party favor! It’s a great way to capture photos outside of the ones your photographer takes. When looking for the right company for our photo booth, I saw a post about ShutterBooth on the Marry Me Tampa Bay and after visiting their website, they had just what we were looking for. As we were looking for a photo booth, we had heard about a one that could connect to the wi-fi they guests could immediately upload photos to social media. Once uploaded, the photos moved through like GIFs. Both features were something we thought our guests would enjoy. We really wanted to ensure that when our guests left, they had danced the night away and never felt like they were seated at their table without a purpose. Specifically, we were looking for a party, and we intentionally served dinner while there were speeches so that when everything was finished everyone could get up and dance! We also wanted to make sure that our DJ played the right mix of music. We had many generations at our wedding and while Jacob loves rap music, we wanted to make sure that everyone had something to dance to during the earlier hours of the evening. We interviewed a handful of DJ companies, however, a lot of our research kept pointing us back to Grant Hemond & Associates based on their experience and reputation for success. They had also been on a few of our vendors’ preferred vendor lists, which definitely something we took into consideration. Overall, they were affordable and easy to communicate with, which was something that was very important to us. I was able to meet our DJ prior to booking our wedding and hear him play. Adam was very talented, and his style was just what we were looking for from a professional. First and foremost, talk to one another about each person’s overall vision and the desired level of involvement in planning the wedding. Communication is so important in a relationship and not everyone has the same vision, so it makes everything better when you and your significant other have taken time to discuss exactly what you envision for your special day. Make sure you do your research and don’t just pick the first option you see. Being able to see a handful of venues or interview vendors really helps to solidify what is going to work best for you all as a couple. 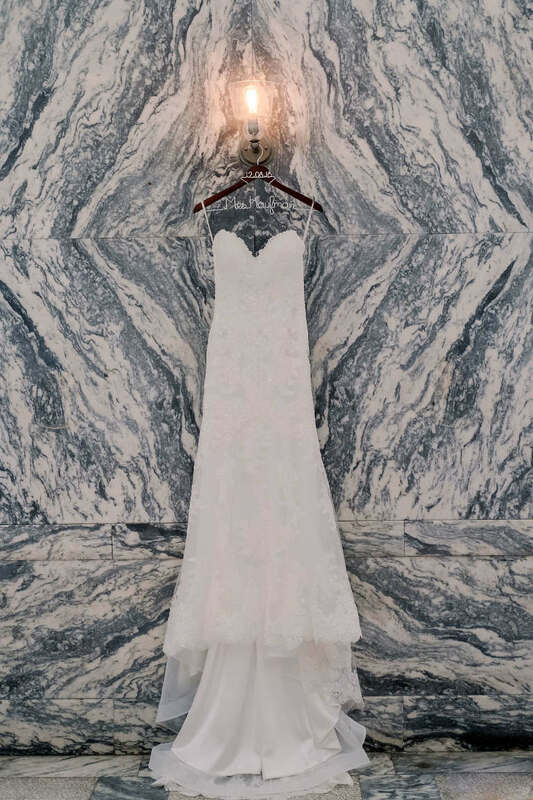 It may seem overwhelming with all of the choices you have to make, and you may not always have a clear understanding of what you want, but, when you compare and research, it makes it a lot easier to find the qualities and characteristics in vendors and venues that work best for you both. Reviews are something I would also heavily suggest checking. A lot of things may seem great on paper, but reviews will help provide another perspective and help provide insight. Meet with vendors before hiring them. It can be very time-consuming, but it’s worth it, as it made all the difference for us. Meeting with people helped us understand their style, their personalities and how they interacted with us. Some things can be done over the phone, but if you can, I highly recommend meeting someone face-to-face either in-person or via video chat to make sure they are the best fit for you. Lastly, remember to love one another. Weddings can be stressful as there is a lot to do and many people have an opinion. What is most important through the process is that you and your significant other continue to communicate and work through things together. At the end of all of the planning, the end result is a day to celebrate the love you two share and the continued support for one another as you move into the next chapter of your life together.